Bob Young was born in Bakersfield, CA., on January 15, 1916. 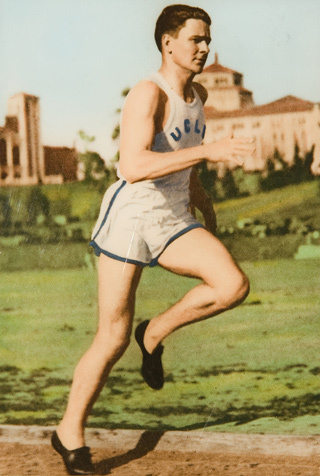 As a relay runner, he was to compete in the 1936 Olympics and would go on to win a silver medal. But despite these two historic (and very cool) accomplishments, Bob Young’s “coolest ever” accomplishment was a very unique one. He gave the finger to Adolf Hitler. Bob was born and raised in the Weedpatch area of California. He attended Kern County Union High School (later renamed Bakersfield High). After graduation, he studied and ran track at Bakersfield College. It was at Bakersfield College that Bob met his future wife, Alice. Although giving Hitler the finger may have been Bob’s coolest moment, his greatest achievement in life would undoubtedly be his happy, storybook marriage to his beloved Alice. The couple were married for an astounding 71 years. As mentioned, Bob’s relay team won a silver medal in Berlin, though of course he, and everyone else, were overshadowed by the immortal Jesse Owens and his capturing four gold medals at the legendary Olympic meet. Young later graduated from UCLA in 1937. He and his amateur relay team set the two-mile relay world record shortly thereafter. Unfortunately, Bob’s promising amateur athletic career ended in 1938 when he pulled a hamstring. But this was to be a bittersweet moment for Bob Young. After his injury, he landed a job with Standard Oil, which brought him back to his Bakersfield hometown. And back to Alice. They met again at the La Granada ballroom. The couple renewed their ties and fell in love. They were married on July 14, 1939. Bob and Alice raised two sons together, Michael and Gary. During World War II, Bob became an auditor and civilian administrative officer for the U.S. Navy at Terminal Island Naval Base & Shipyard in Southern, CA. After the war, Bob and Alice moved back to Bakersfield. In 1955, he became a pioneering grape farmer in Paso Robles. The young family lived on their vineyard for 22 years, made friends, and sold their grapes to the Paul Masson Winery. Bob began enjoying a happy and deserved retirement in 1977. Bob’s happy retirement included being the proud grandfather of 9 and the great-grandfather of 22. “He was a very humble man”, recalled his son Mike, “He was just a regular guy.” Bob Young died on February 3, 2011, at the age of 95. Bob was many things: husband for 71 years; proud father, grandfather and great-grandfather; winner of an Olympic silver medal; part of a world-record-setting relay team; successful grape farmer; and a guy who directly gave Hitler the finger. It doesn’t get any cooler than that. Not a lot of information about flipping the bird to a mass murderer…I was only interested because it has the same feeling as kicking a brown bear in the crotch.